In line with the key message of the Italian G7 Presidency - "Building the foundations of a renewed trust" - we decided to give our communication an approach of full transparency. Safeguarding the negotiation process and its necessary confidentiality, we described on the website and on social media the great work that took place behind the scenes of the G7. 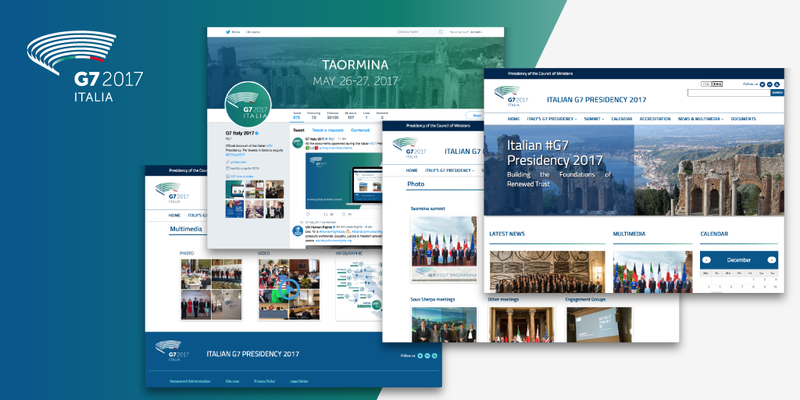 We have posted 121 articles in Italian and English on the main events - the Taormina Summit and the 13 Ministerial Meetings – as well as on the technical workshops, the working groups and the side events held throughout 2017. It has been a huge effort, recognized by our partners, to communicate the G7 with an open approach and with the use of multimedia. We have created 27 photo galleries containing hundreds of images from all the meetings and produced over 60 videos in English and Italian. On the two Twitter channels, in Italian and English, we posted almost 700 tweets with continuous updates on the activities of the Presidency, the Ministries, all the institutions and stakeholders involved. We have paid special attention to international communication with the aim of highlighting Italy's commitment to achieving the key objectives of this G7. On our website we have received visits by users from all the countries of the world, thus demonstrating the interest that the topics addressed by our Presidency have been able to generate in this year of intense activity.